We live in a world, nay a galaxy, full of mash ups and because of that it was only a matter of time before someone combined Star Wars and French electronic mega-duo Daft Punk. Luckily for us, that someone was inspired filmmaker Brian Curtin, who could create something super fun to watch. It's a lot of walking and it takes a while before anything happens, but the pretty lights and the music are all top notch. If you liked what you saw, Curtin supplies two additional videos for your dancing pleasure. Who would win in a fight: the Millennium Falcon, or the USS Enterprise? A lot of these celebrities didn't know what they were being asked, but to be fair, I didn't know a lot of these celebrities, so ¯_(ツ)_/¯. Worry not, professional huge nerd Adam Savage brings it home with some fantastic logic, though I for one assumed the Millennium Falcon would just run away and the fight would never happen. What Took This Mad Max/Star Wars Mash Up So Long to Get Made? It should have existed a good two months ago, right? Childhood ruined or childhood enhanced? You tell me! These cosplayers are taking crossover cosplay to new heights combining Disney Princesses with Slave Leia, who I suppose is technically a Disney Princess herself! The Han Solo film is the third movie to be announced in the Star Wars Anthology trilogy. The other two will focus on the Rogue Squadron of fighter pilots, titled Rogue One, and on Boba Fett, the notorious bounty hunter who freezes Han Solo in carbonite. Who do you think should play Han Solo? If you've ever wished Star Wars was real, now's your moment to curl up on your couch with a glass of blue bantha milk, pretend you're on a planet with two suns and learn about the Battle of Endor from the History Channel. Because lets be honest, even if the world of Star Wars was our reality, we'd probably still be doing the same things. The police force is strong on this one. It started in Charleston, S.C. when cops noticed Lloyd driving a Nissan at around 80 MPH. They began to chase him, and Lloyd's reaction was to speed up, weaving and narrowly missing cars and trucks. He even used the median to pass vehicles. Lloyd hit several trees and was taken into custody and charged with reckless driving, failure to stop, resisting arrest and driving without a license. Maybe the attorney should plead that George Lucas traumatically damaging Lloyd's (and most others') childhood, leading him to a life of recklessness. Or maybe the dark side was just far too compelling. News of Christopher Lee's death rang around the web June 11. We thought we'd honor him by listing some of his best turns as villains from recent and classic movies. I wasn't a Stormtrooper. 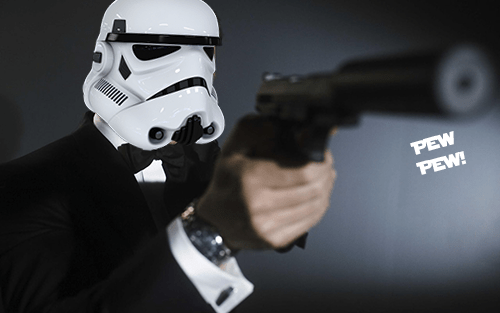 Daniel Craig, he was a Stormtrooper. I shouldn't have said that. Considering Craig's previous roles, I'm hopeful that his Stormtrooper will be a decent shot. This LEGO Millennium Falcon is over three and a half feet long and 40% bigger than the biggest official LEGO replica. How well do you think it can manage the Kessel Run? "I was cool in high school so I didn't see it."